As a mother, it's hard to imagine choosing a favorite child. It's even harder to imagine allowing one of your children to be denigrated by the whole family, mocked and ridiculed. 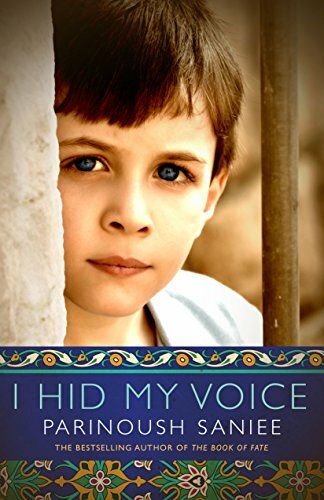 But in Parinoosh Saniee's novel, I Hid My Voice, four year old Shahaab's lack of language, brings shame to his family and to himself and the family makes little effort to show him that he is more than his unheard voice. Shahaab is mute. There's no physical reason for his lack of language and he understands everything said and done to him but because he himself is unable to communicate, he is considered dumb and is often treated as if he is invisible. He hears and sees things that he is really too young to witness but being an observant child, he takes it all in. His family is not a happy one and even in the extended family, strict gender roles are firmly adhered to, making it that much worse that Shahaab is an embarrassment to his father. Shahaab acts out in frustration, earning a reputation as a bad little boy, except in the eyes of his kindly grandmother and one doting cousin. But acting out is just another way to get attention, albeit the same negative attention he receives for being mute. The novel is one of small instances in the life of an unhappy family with an unusual child rather than a big and sweeping story. Shahaab narrates his own story, giving him a voice and the reader a glimpse into the mental effects of the unkindnesses done to him. This insight allows the reader to feel sympathy for this forgotten and almost unloved middle child. His family members are fairly one dimensional, and whether this is a function of a very young narrator who would not see nuances in those around him or of the translation of the novel itself, it's hard to say. In any case, the writing feels simplistic. The majority of the novel takes place in Shahaab's young childhood but it does eventually take him to the age of twenty to see the effects that this early treatment of him has had. This is an easy read and quick read with an interesting premise but over all it felt like it was lacking something.